Indigo is called “the living color “, come find out why for yourself at Culler Studio’s Indigo Fun Day! Bring items from home or newly acquired pieces to dip in the Indigo Vat. 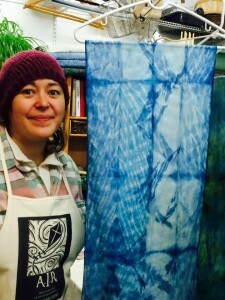 Sara will guide you through learning the basic Shibori techniques ( folding, clamping, stitching, pole wrapping ) to make resist patterns for the fabrics. Next experience the magic of dipping fabric into a vat of green looking dye and watching it transform to blue as it comes up out of the Indigo. The more you dip the darker the blues.